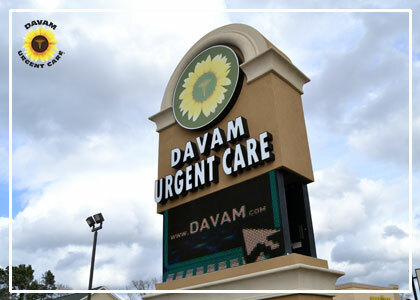 Davam Urgent Care Clinic located in Magnolia, TX provides non-emergency medical care for children and adults. Each patient is seen and treated by a board-certified medical provider without long wait times. Our providers can provide treatment for many different illnesses such as flu,cough, sinus infection, strep throat, dehydration, ear pain, and more. We also provide additional services such as school physicals, sports physicals, flu shots, drug screening, and digital x-ray. Convenient Care- An appointment is never required and walk-ins are always welcome. In addition we are open daily, 8am-9pm. Patients can make reserve a spot using our online check-in system to allow for shorter wait times. Affordability- Most major insurance plans are accepted at Davam including Blue Cross and Blue Shield, Aetna, United Healthcare, Humana, Cigna, and more. Prompt-pay pricing is also offered for those without insurance. Our membership program also helps to provide affordable care for the uninsured or for patients with high deductible plans. Award Winning Patient Care and Customer Service- Davam Urgent Care has received multiple awards since opening in 2014. These awards include Best of The Woodlands three years in a row, Best Urgent Care- Living Magazine two years in a row, and many more. Our clinic in Magnolia also has over 1,000 five star reviews across the internet. We are proud to provide a five star experience for every patient that visits Davam. If you or your loved ones are needing to visit a clinic in Magnolia, TX, visit Davam Urgent Care located at 6022 FM 1488 Magnolia, TX 77354. For more information please contact (281) 583-1980. Our clinic conveniently serves the Magnolia zip codes of 77353, 77354, and 77355.Open daily 8am-9pm.